The Choir of the Cathedral of Saint John the Baptist is an ensemble of about 40 singers professional and volunteer singers from throughout the Savannah area. 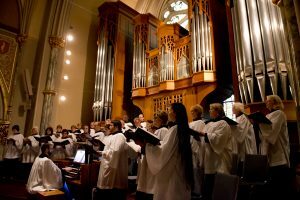 The choir rehearses on Wednesdays from 6:00 – 8:15 p.m. and provides music for the 10:00 a.m. Solemn Mass each Sunday from September through June. The Choir also maintains a rigorous schedule of episcopal celebrations, diocesan liturgies, and concerts. The Cathedral Choir’s repertoire is drawn from the great tradition of Catholic music. The choir sings Gregorian chant, Renaissance polyphony, plus the great works of 19th, 20th, and 21st-century composers. To join the choir or to for any further information, please fill out the form below. Those who join the choir will have a short placement hearing scheduled with Dr. Thornock privately. If Yes, which voice part have you sung?